The OSCE Representative on Freedom of the Media plays a crucial role that is valued tremendously by journalists and media freedom groups to speak out in defense of press freedom in states of the Organization for Security and Cooperation in Europe. At a time when press freedom is deteriorating in many OSCE states–from Russia, where journalists are murdered with impunity, from Turkey, where President Erdogan is jailing large numbers of journalists, or Hungary and Poland, where state media is tightly controlled by government–having a voice to raise journalist cases and hold states to account is vital. In an interview with Vocal Europe, Harlem Désir, the new OSCE representative, expresses his take on some of the critical challenges to the freedom of expression, media and journalists in Europe and in its neighborhood. He discusses his plans for the role and explains why he is prioritizing journalist safety, fighting impunity, and combating violent extremism online. Vocal Europe: What can you, as OSCE RFoM, do to address current challenges in the OSCE region related to media and conflict, safety of journalists, including female journalists? Harlem Désir: Safety of journalists is my first priority. In terms of the physical safety of journalists and impunity for crimes committed against them, I will address this issue whenever it occurs in the OSCE region. Moreover, online threats and intimidation are a growing problem everywhere, with female journalists being specific targets when it comes to this kind of abuse. These threats have become part of daily life for many, leading often to self-censorship. Law enforcement bodies must follow up on cases and take these issues seriously. My Office has been working on this issue since 2015 and we are now increasing our efforts to provide resources and tools and create support networks for journalists who have been subjected to online harassment. We are also creating an online resource hub to facilitate increased cooperation between all stakeholders and developing an awareness raising campaign to better show the far reaching impact of this type of harassment and the need for all international stakeholders to address this issue as a threat to media freedom. 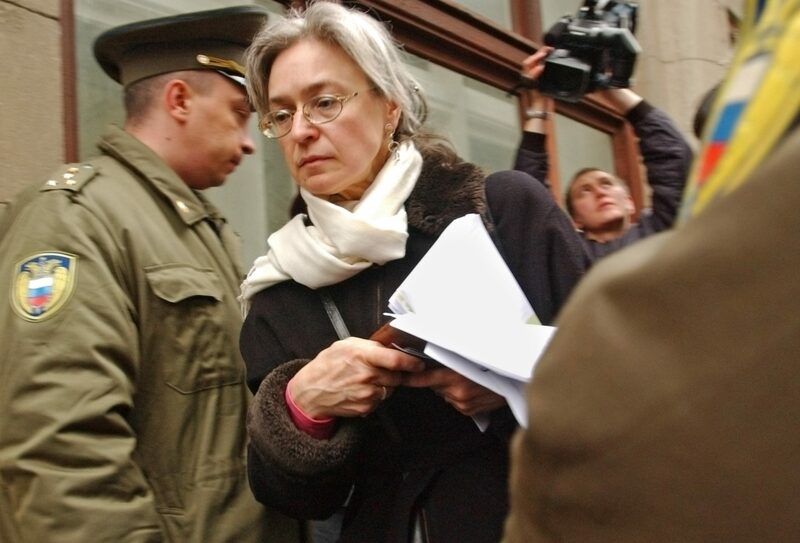 Vocal Europe: Soon on October 7 it will be the eleven-year anniversary of the killing of Novaya Gazeta journalist Anna Politkovskaya in Moscow, Russia. How would you describe the situation in Russia today, almost 11 years later, with regard to impunity for crimes committed against journalists? Harlem Désir: Without question, impunity continues to be one of the leading challenges in terms of media freedom. Politkovskaya paid the ultimate price for her life-long commitment to investigative journalism, and the masterminds behind her assassination are still at large. Anna Politkovskaya, a Russian journalist, writer and human rights activist, was assassinated on 7 October 2006. She was known for her opposition to the Chechen conflict and for criticism of Vladimir Putin. Her death is a horrific reminder that journalists’ safety should be adequately addressed in the Russian Federation. Much more needs to be done to eradicate impunity for crimes committed against journalists, not only in Russia. There are a number of OSCE participating States where impunity has become a growing problem and where serious attention is required. The OSCE participating States need to step up their investigations and identify and prosecute those who commit crimes against journalists. Vocal Europe: What role do media play in the conflict in and around Ukraine? Harlem Désir: Media and press are always under strong pressure in conflict situations. There is a risk that propaganda prevails. As has been said before, “in war, truth is the first casualty”. Reporting from any conflict is never an easy task, but media has a potential in facilitating conflict resolution as long as the reporting is objective and independent. The media has an essential role in keeping society informed. Even in difficult times, governments must ensure free flow of information and take particular care not to adopt restrictive measures. 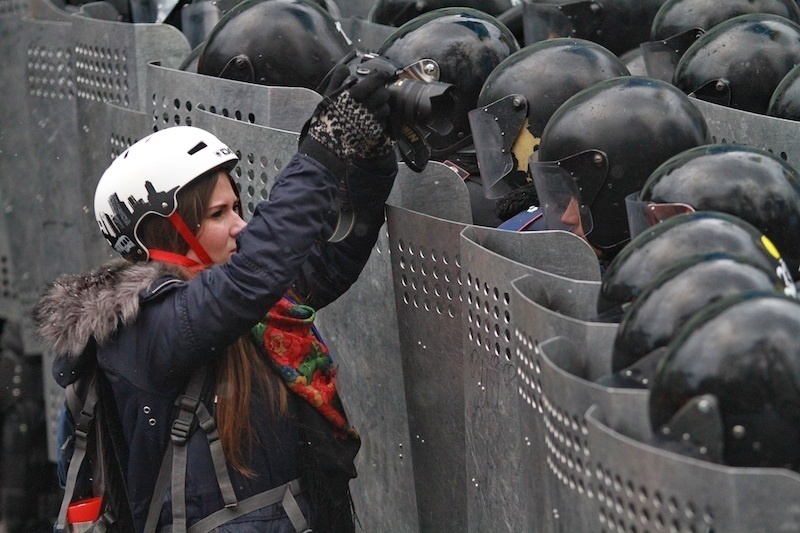 A female journalist at the EuroMaidan Revolution protests during the dramatic events of the winter of 2013-2014. When the conflict in and around Ukraine started, we witnessed an information war, especially in the regions of the country affected and involved in the conflict. Journalists and other media actors were among the first to be attacked, both physically and psychologically, as those in power wanted to fully control all information. 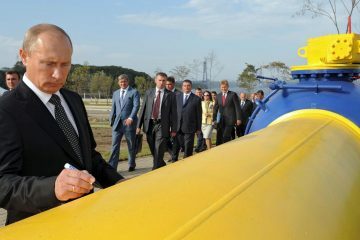 Many media outlets have been blocked and replaced by state media channels originating from the Russian federation, whereas large number of journalists has been silenced, often with violence or threats of violence, both in Crimea and the parts of Eastern Ukraine not under control of the Government. 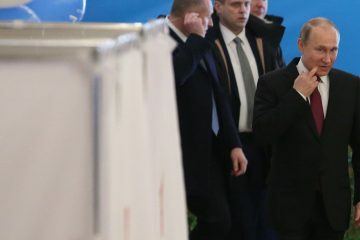 The worrying trends and safety concerns in Ukraine continue, including when journalists risk to be regarded as not patriotic enough in their reporting. If you work under this kind of pressure, it may indeed become hard to maintain objectivity and professionalism. There is no doubt that Ukraine finds itself in a difficult situation and national security concerns prevail. However, I firmly believe that only an open, diverse and dynamic media environment can effectively contribute to democratic path of the country and neutralize the effect of alien propaganda. I am glad to say that I have good cooperation with the Ukrainian authorities, and an open and frank dialogue helps to address many challenges to media freedom in the country. 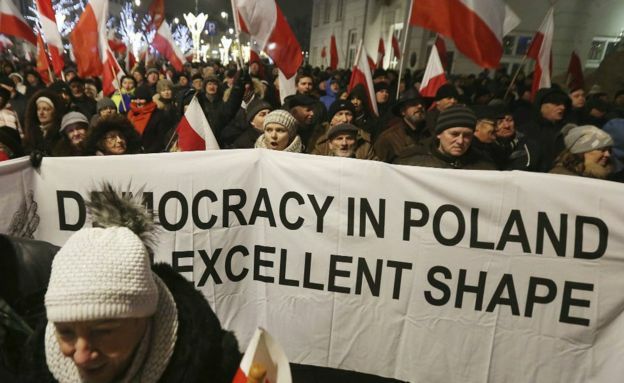 Vocal Europe: How serious are the challenges to media freedom in Poland and Hungary? What exactly can you, as OSCE RFoM, do about that? Harlem Désir: It is disappointing that we are talking about EU Member States, who should lead by example. I share the fundamental concerns expressed by my predecessors on media freedom and free expression in Hungary. Following the restructuring of the media landscape in the country in 2010-2012, public service media has become highly prone to political pressure, while critical private media outlets struggle with economic difficulties partially caused by the lack of state advertising. In 2013 we also saw changes to the Criminal Code that can further restrict media freedom, making it possible to punish the preparation and distribution of potentially defamatory video or sound recordings with up to three years of prison. 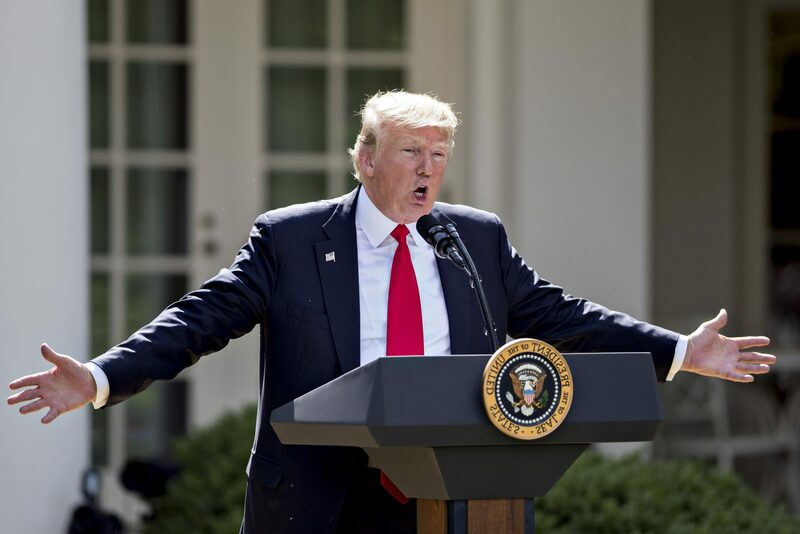 The Freedom of Information Act, amended in 2016, brought in further regressive changes, including the introduction of potentially very high fees for the work of public officials in answering information requests, and new grounds for refusing to respond to requests. I also note the recent blacklisting of journalists, depicting them as foreign agents, as this threatens their safety. As for Poland, I have observed a series of actions placing public service media broadcasters under strict control. These include the provisional law of December 2015 giving Ministry of State Treasury power to appoint and dismiss public service media’s senior management and boards of directors and also a law of 2016 which transfers these competences to the new National Media Council. Public service radio and television have been under pressure to refrain from criticizing the evolution of the governance and operation of the public service media. Furthermore, the Government’s attitude towards the media was reflected in the temporary ban on all journalists entering the Parliament in December 2016. The proposal sparked days of protests and was later withdrawn. Demonstration in front of parliament in Warsaw, Poland, 17 December 2017. Recently, I intervened on a complaint filed by Poland’s Defence Ministry against the journalist Tomasz Piątek. The Defence Ministry claims that Piątek may have committed a criminal offence in publishing his new book, Macierewicz and His Secrets. If the case against the journalist is pursued, the charges could carry a penalty of up to three years in prison. In a letter to the Minister of Foreign Affairs I stressed that restraint must be shown in reacting to reports and publications with judicial action, in order to protect freedom of the media in line with national obligations and international standards and commitments. My role is to point out when I see that a participating State falls short to its media freedom commitments. So I have done, and I will continue to do so. My Office closely monitors the developments. 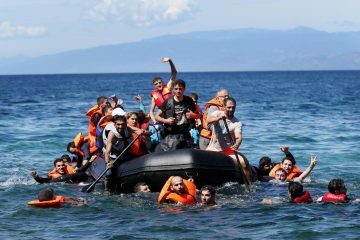 Vocal Europe: Since the 2016 failed coup attempt in Turkey, a large number of media outlets associated to various segments of the society including seculars, Kurds, Gulen Movement were effectively silenced through censorship, confiscations and etc. However, one can argue that what we in Europe hear much about victims of media freedom in Turkey seem to concentrate around Cumhuriyet Daily and its former editor in chief Can Dündar who had to flee the country due to potential imprisonment and life threat. How about the media entities linked to Kurds or Gulen Movement? What is your take specifically on the pressure that has been put by the Turkish government on media related to Kurds and Gulen Movement? Harlem Désir: I would like to first emphasize that the pressure faced by journalists, but also by anyone expressing critical views of those in power or of any issues of sensitive nature, has not started with last year’s coup attempt. Media freedom and freedom of expression in Turkey have been significantly weakened for long years, even decades; it is enough to look at the list of issues raised by my Office over the last decade in order to see that a fundamental reform of laws governing free expression and media freedom is overdue, and so is a shift in the approach by the Turkish authorities towards the role of pluralistic debates and unimpeded access to public information. The ongoing criminal trial against journalists and board members of the daily Cumhuriyet, or the imprisonment of numerous international journalists trying to report on various Turkish issues, has attracted more public attention to the situation of the press in the country. It is very important to continue raising international attention to these cases. At the same time, as you say, many other issues require attention as well, including the freedom to report about the Kurdish situation, or about the Gulen Movement, and the situation of media outlets that do so. 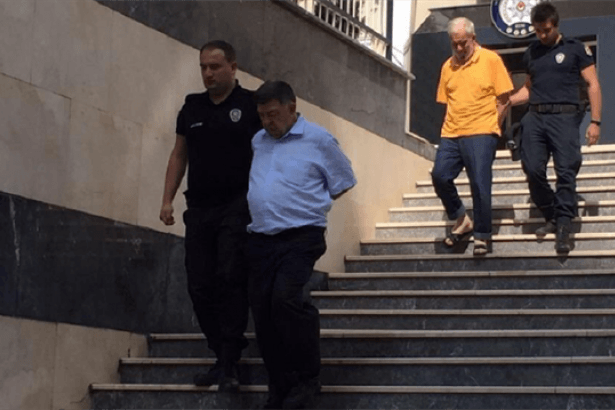 Two veteran journalists Sahin Alpay (front) and Ahmet Turan Alkan (back) were arrested following the closure of Zaman Daily, once the most circulated paper in Turkey. Freedom of speech and expression is the very fundament of any democracy. The essence of free expression is that it must be extended to views we may disagree with, even to views that offend, shock or disturb the State or any sector of the population, as the European Court of Human Rights rightly emphasized already four decades ago. This is the only way to ensure that pluralistic debates, essential in any democracy, remain free. Therefore, the attitude by the authorities towards pluralistic and free debate gives reason for major concern, especially after the coup attempt since when the pressure on media outlets and individual journalists has become nothing short of critical. 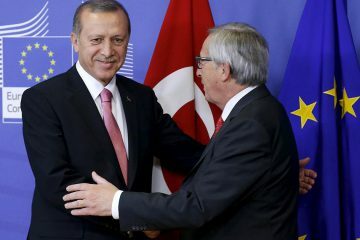 I have addressed the situation for media freedom in Turkey on numerous occasions and repeatedly called on the authorities to drop charges and release all journalists in prison and embark upon a series of fundamental legislative reforms aimed to bring the laws governing media freedom and freedom of expression in line with international standards. I have stated that my Office stands ready to assist the government with advice on possible reforms.